The success of Union Green is founded upon the individuals that plan to call it home - and we are excited to turn this development into a reality for them. With 90% of properties already sold, we wanted to celebrate the Union Green community by speaking with future residents about what inspired their purchase, and what differentiated Union Green from the rest of the market. As part of the People of Union Green series we speak with Ben about inner-city living and leaving the car behind. It seemed to be a design-led. You could tell thought had been put into the aesthetics of the development, which is not common in the current Auckland market. What got you across the line? The process was very simple and straightforward. Tell us about your current living situation? I’m a bachelor…and I like bachelor pads. What’s your occupation and where are you based? 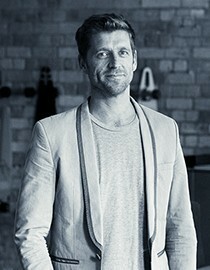 General Manager of a Digital Design Business based in both Wellington and Auckland. What style or architecture and design are you interested in? Minimal and contemporary - the way the Scandinavians do it. What do you think living in Auckland’s inner-city will be like in two years time? I think inner-city living will become very common in the next few years. It just makes sense and Aucklanders will soon realise that mowing their lawns and cleaning out the gutters is rather boring. What are you most looking forward to when you think about the prospect of moving into Union Green? Ease of lifestyle, views, no traffic, neighbours, local restaurants, walking to work etc? All of the above is interesting. Mostly I’m looking forward to the ability to leave my car at home, walk to work and live a more realistic urban lifestyle that’s not unlike other international cities.